On this long-running and popular program, students spend six weeks studying Spanish language and culture or interning in Madrid with Rollins' own Prof. Prieto-Calixto. Verano Español (or Spanish Summer) celebrated its 55th anniversary in 2016 and is one of the oldest and most prestigious American summer study programs in Madrid. This program, led by Prof. Prieto-Calixto, is based in central Madrid at don Quijote (dQ), a language school located near the Museo del Prado, Parliament, and Plaza Santa Ana. Recognizing that successful language training cannot take place in a vacuum, Verano Español provides a series of cultural activities throughout the summer designed to provide students with a fuller sense of Spanish language, life, and culture. For example, the program includes a weekend trip to Candelario and other scheduled cultural activities. The program offers two tracks. The "Language & Culture Track" is designed for students of all proficiency levels interested in complete immersion in Spanish language and culture, while the "Internship Track" offers advanced Spanish language students the opportunity to continue studying Spanish while at the same time participating in a full-time, professional business internship. Both tracks on the program are 6 weeks long, offer Spanish homestays, and all courses are conducted in Spanish by native Spanish faculty. Internships are only available in business fields. Students are required to book their own flights to Madrid. Depending on when you arrive, Prof. Prieto-Calixto and/or the Student Site Leader will meet you at the Madrid Barajas airport. Orientation will begin on the first night of the program at a hotel in central Madrid (the hotel is included in the program fee). Students have a welcome dinner the night of arrival and have a full orientation the next day—the orientation introduces students to the language school and the city. Students then meet their host families in the late afternoon/evening after the orientation and move into their homestays that night. Classes begin the following morning. The foundation of instruction at dQ is a communicative methodology of language learning that stresses students' immediate and active engagement in language acquisition. Classes are small, usually around 8 students, and instructors utilize strategies of rapid and intensive language acquisition. Language and Culture Courses: All levels of intensive language courses, from beginning to advanced, are offered at don Quijote. Students will be placed into the 2 courses that come after the last Spanish course they completed at Rollins (some students can use these courses to fulfill their "F" requirement). For example, if a student completed SPN101 at Rollins during the Fall Semester, that student will be placed into SPN102 and 201 at dQ. Prior Spanish language courses at Rollins not required. Classes at dQ are small, usually with 8 - 10 students per class and will include Rollins students and other students from around the world who are also studying Spanish. Classes meet 4 - 5 hours per day, Monday through Friday, and students will receive a total of 8 Rollins credit hours upon successful completion of the program. Internship Track Courses: Students participating in the internship will take one 300-level language course in addition to the internship. The course focuses on preparing students for their internship experience, and will begin with an intensive first week, requiring 5 - 6 hours of class per day. Students will then continue their language work 1 day per week for the remaining 5 weeks of the program. During the other 4 days of the week, students will work at their internship site. All interns are placed at IFEMA, a company that manages trade fairs and other business events for a wide range of companies and fields in Spain and Europe. On this track, students will receive 4 credit hours for a 300-level language course and 4 internship credit hours - totaling 8 Rollins credit hours upon successful completion of the program. All courses appear on the Rollins transcript as Rollins courses and the grade that students receive in Madrid will also appear on the Rollins transcript (meaning your grades abroad will be factored into your Rollins GPA). Verano Español's Faculty Director in Spain is Prof. Alberto Prieto-Calixto, Professor of Spanish at Rollins and a native Spaniard. Prof. Prieto-Calixto will oversee program academics, organize program excursions and meals, and assist students with their transition to their homestays and to life in Madrid. Student Site Leader: A former Verano participant and graduating Rollins senior will join the program as a co-leader with Prof. Prieto-Calixto. The Site Leader will plan cultural activities for the group, assist students in adapting to Madrid, help students navigate challenges relating to homestays and academics, and will offer tutoring services for Spanish classes. Living with Spanish hosts during the summer is an integral part of the program: because students are considered a member of the family, it gives them an inside perspective on Spanish society not available in a dorm room. Students complete a housing questionnaire as part of their application and, after acceptance, are carefully matched with families or single adults who are eager to welcome students into their homes. The host provides a room, two meals per day, laundry service, and all linens and towels. Homestays are available in residential neighborhoods in several different areas of Madrid; however, exact locations of the homestays will not be available until the day of orientation. The exact family structure and arrangement of each homestay can vary. In general, students will share a double room with another Rollins student in a multi-room apartment with their host family. In most cases, other students who are also studying at don Quijote will occupy the other rooms of the homestay. The homestay provides two meals a day—students choose which two meals depending on the location of their homestay, their schedule, and other considerations. Students also receive group lunches that are scheduled once a week across the program and meals during the orientation and weekend excursion to Candelario. For additional meals, consider budgeting about 8-12 Euros per meal for a simple, take-out style lunch or 10-20 Euros for a sit-down meal. Madrid is a dynamic and exciting city, particularly in the summer when the daytime weather is very hot. Spaniards and tourists fill the streets, plazas, restaurants and shops through the evening and into the night. Madrid is famed for its incredible museums, lovely parks and squares, historic buildings and churches, and wonderful food and music. Transportation: Each student will receive an Abono de Transporte (a transportation pass) for use on Madrid's metro and bus system. This pass is included in the program fee and will give students unlimited access to Madrid's superb public transportation for the duration of the program. It will serve as a great resource for getting to/from classes, homestays, internships, and Madrid's many sights and events. Weekend Excursion to Candelario: Candelario is a small town well west of Madrid, near the Spanish and Portuguese border. 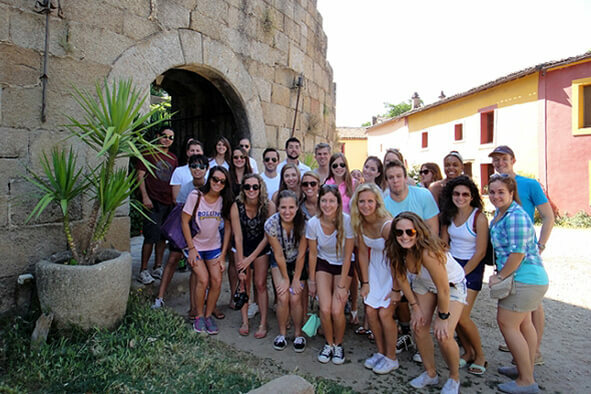 This incredibly popular group excursion is organized and led by Prof. Prieto-Calixto and offers students a genuine look at real Spanish life outside of the standard tourist destinations. Activities include a pottery workshop and a guided hike in the beautiful landscape around Candelario. All meals and accommodation are also included. Past students have often commented that the Candelario weekend was a highlight of the six-week program. Advising is offered on a walk-in basis: Tuesday-Thursday from 12pm - 2pm. If you are unable to make it at these times, email us for an appointment. We can also put you in touch with members of our Global Ambassador Program. These are students whom have completed a study abroad program and would be happy to share their experiences with you. For application instructions, click the application link at the top of this page. Please Note: This program has a required advising session (30 mins) as part of the application process. Please email Mary Robinson at mrobinson@rollins.edu to schedule an appointment. Walk-in advising is for informational purposes only. Tuition, internship placement and supervision (for the internship track), airport transfers in Spain, weekend orientation in Madrid, homestay accommodations (2 meals per day at homestay) + 1 group lunch per week, program excursions, transportation pass, course materials, and health and emergency insurance.